Ramen is another quick and nutritious dish which is fairly easy to prepare and make. What gives it the Japanese flavour is the inclusion of miso/soybean paste, seaweed, and gomashio/roasted sesame seed and salt. Eating seaweed is good for you, so good, in fact, that seaweed might soon be an ingredient in functional foods – to make white bread. Seaweed is high in fibre. Scientists at the University of Newcastle upon Tyne have researched alginate, and found that it can strengthen gut mucus (which protects the gut wall), slow down digestion (so you feel fuller for longer) and make food release its energy more slowly. A Japanese study showed that high seaweed intake increases the good bacteria in the gut. The enzymes in kombu/kelp, which you can add in dried form to soups and stews, help pre-digest pulses, which in turn reduces wind. Seaweed may also improve heart health and is also good for detoxing. Seaweed is very high in lignans – these are plant substances that become phytoestrogens in the body, which help to block the chemical oestrogens that can predispose people to cancers such as breast cancer. Sesame seeds add a nutty taste and a delicate, almost invisible, crunch to many Asian dishes. They are also the main ingredients in tahini (sesame seed paste) and the wonderful Middle Eastern sweet call halvah. Not only are sesame seeds an excellent source of copper and a very good source of manganese, but they are also a good source of calcium, magnesium, iron, phosphorus, vitamin B1, zinc, molybdenum, selenium, and dietary fibre. Miso means ‘fermented beans’ in Japanese. In Japan, people begin their day with a bowl of miso soup, believed to stimulate digestion and energise the body. 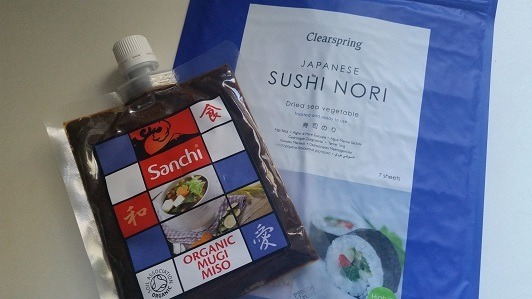 A traditional ingredient in Japanese and Chinese diets (hoisin sauce), miso paste is made from fermented soybeans and grains and contains millions of beneficial bacteria. The protein-rich paste is highly popular as it provides an instant flavour foundation. It adds the fifth taste, known as ‘umami’, to all sorts of dishes including soups/broths, salad dressings, vegetables, stews, glazes, and marinades. 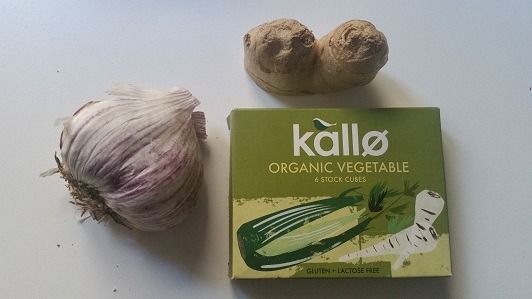 Miso is rich in essential minerals and a good source of various B vitamins, vitamins E, K and folic acid. 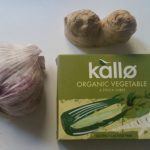 As a fermented food, miso provides the gut with beneficial bacteria that help us to stay healthy, vibrant and happy; good gut health is known to be linked to our overall mental and physical wellness. 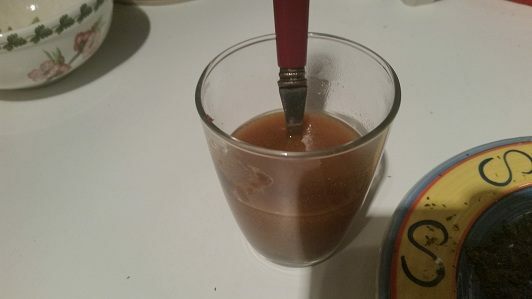 Miso is a live culture, especially the ones sold in health food shops. There are different flavours of miso, I like to use mugi/barley miso as it is particularly suited to a northern European climate. 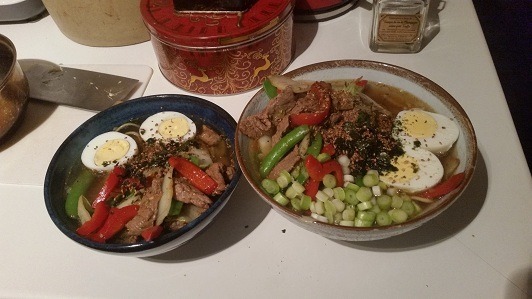 Ramen is a broth based dish with noodles, meat, hard boiled eggs, stir fried vegetables, garnished with spring onions, toasted seaweed and Goma Shio/toasted sesame seed and salt. Ramen contains 3 protein sources, so it is very good to keep out the cold. Preparation takes about 10 minutes and the cooking another 10 minutes. 100g. noodles per person Wheat or rice noodles are fine. I prefer rice noodles for broth dishes and wheat noodles for fried dishes. This doesn’t take a lot of time to prepare, and the cooking time is not that long either. Put the eggs in cold water, bring to boil and simmer for 8 minutes. While this is happening you can do the rest of the preparation. For the Ramen broth, put some toasted sesame oil in a saucepan along with some garlic and grated ginger. Saute for a few minutes and add hot water and bring to a simmer. Amount of water depends on the number of portions you are making, about 100 ml. per serving. Add the 5 spice, stock cube, soy sauce, chilli sauce and Worcestershire sauce. Simmer for 5 minutes until the stock cube is dissolved. Thinly slice the beef and place in a bowl. Slicing thinly will maximize the surface area to catch more flavor as well as ensuring a quick frying time. Add a clove of garlic, the rest of the grated ginger, soy sauce, toasted sesame oil to taste, chilli sauce to taste and a few drops of rice wine. Allow to marinade until ready to start cooking. To make Goma Shio, add 6 tablespoons of sesame seeds to a dry frying pan and slowly roast until they are brown and starting to pop. Add 1 tablespoon of sea salt to the pan and roast for another minute or so. Combine these ingredients in a mortar and grind them together until they are fairly fine. This is enough Goma Shio to last for a while and can be stored in a jar or spice pot. Take a half sheet of Nori Seaweed and slowly roast in a dry pan until crispy. This takes about a minute. Rub the toasted seaweed between your hands to make small flakes. Bring some water to the boil, add the noodles and cook until done. Fry the beef in a hot wok until it starts to turn brown. 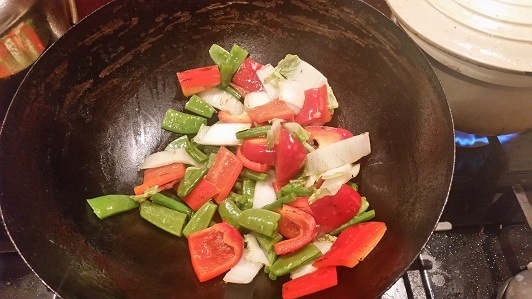 Add the chopped pepper, Chinese cabbage and beans/peas and cook until done, another couple of minutes depending on the temperature of the wok. Some people don’t like raw spring onions, in that case add them to the wok for frying. Heat up the broth. Add the miso paste. Make sure the broth is not boiling. Miso is a live culture so boiling would kill it. Peel the eggs and cut in half. Drain the noodles and place them in a serving bowl. Arrange the meat and vegetables to one side and the hard-boiled egg on the other. Cover with the broth. Garnish with the spring onions, toasted seaweed and gomashio.